Industry-leading air conditioning manufacturer, Daikin Europe has launched the next generation in high efficiency chillers. The new water cooled EWWD-VZ, offers the highest ESEER ratings in its class, minimising running costs and CO2 emissions to make it the most efficient in the market. The launch is the latest in a range of innovative products developed by Daikin to help specifiers and end users stay one step ahead of EU legislation and rising energy costs. The extremely compact VZ chiller series incorporates a number of advanced technology features that are unique in the market. Presenting a 40% reduction in footprint, the new chiller offers a low noise solution with outstanding flexibility to match any specific application. The advanced design of the new VZ delivers perfect balance: Achieving high cooling capacity with reduced power inputs and is especially efficient while running at part load, typically 97% of the operating time. Operating up to 15% more efficiently than other systems on the market, the new chiller achieves an EER of 5.7 at full load, with an ESEER of up to 8.3 at part load. The new VZ chiller series has been developed to achieve maximum efficiency and is future-proofed to comply with existing design and regulatory standards as well as longer-term EU energy goals. that reduce consumption in use. With up to 50% of building energy usage accounted for by HVAC equipment, the new VZ can help boost the environmental credentials of buildings to achieve a high BREEAM or LEED score with lower running costs, making assets more attractive to building owners and tenants. The new chiller is the result of applied innovation combined with new technology advances. The new chiller’s unique design uses Daikin single screw compressor together with inverter technology with a high efficiency flooded type heat exchanger that offers a 60% improvement in heat transfer if compared to previous chiller series The series offers a wide range of capacity with single compressor models from 450kW to 1,100kW and the larger dual compressor dual circuit models with an output between 1,200kW to 2,100kW at nominal Eurovent conditions. The new VZ width has been reduced to the minimum levels thanks to a unique design with new single pass counter-flow condenser and an oil separator integrated into condenser shell. The slimline design of the unit, is also available with an optional knockdown panel, makes it ideal for installation through existing doorways. The new chiller boasts the widest operating conditions in its range, offering not only cooling, but hot water production up to 65ºC. 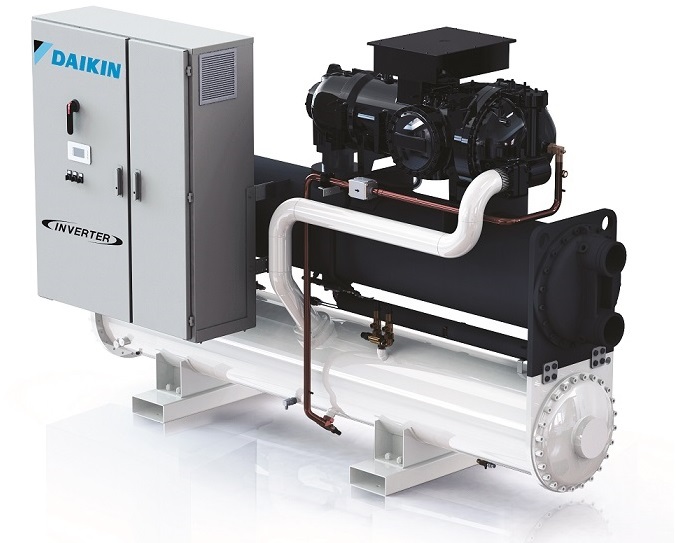 Its unique design incorporates Daikin Variable Volume Ratio (VVR) technology, which optimizes unit performances by adjusting the discharge pressure of the compressor to the condensing pressure. No under or over-compression phenomena (common in traditional compressors) are experienced, thus efficiency losses are reduced to minimum. Suitable for use even in noise-sensitive environments, a high performance sound proof compressor cabinet option offer noise levels as low as at 81 dBA at full load and 66 dBA at part load at a distance of one metre. With active harmonic filtration and an automatic transfer switch to backup generator, the new chiller series offers a comprehensive solution for data centres applications. Enabled for operation via the Daikin On Site platform the VZ can be monitored remotely, allowing the system to be accessed with one click for system optimization and preventative maintenance. With an environmental profile that outperforms the market and delivering outstanding versatility, the new chiller also delivers on cost-effectiveness, as well as innovation. If compared to a traditional non-inverter product, the Daikin VZ can achieve a 25% reduction in running costs with return of investment in less than two years.